With this board, I wanted to create a very simple, yet elegant garden wedding. 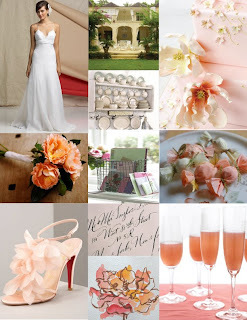 Using one of my peony note cards as inspiration, I worked with a subtle palette of white, peach, and pink, with pops of citrus and gold. Balanced with nature's lush greens and the simplicity of the off white earthenware, it would be perfect for a springtime wedding. Oh! And can we please take a moment to look at those amazing shoes? I fell in love the moment I saw them.